In 1993, the German label "What's So Funny About.." released a compilation called "Novaya Scena - Underground from Ukraine! ", featuring some of the most interesting bands from the music scene in Kiev and Kharkov between 1986 and 1992. Novaya Scena (New Scene) was an illegal cultural formation, started in the 80s by Sergey Myasoyedov and Sasha Panchenko in Kharkov, originally with the intention to connect the academic avant-garde and the rock underground. That never quite worked out, but still Novaya Scena produced some great music, spanning genres from Punk, No Wave, Folk, to Avant-Garde. 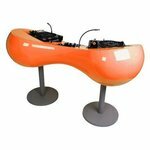 I have grouped the mp3 files by bands, and added some descriptions and background info, mostly taken from the liner notes. This is not the order in which the tracks appear on the CD, but the mp3 files are named and tagged with track numbers. The transliteration of Cyrillic names is a notoriously ambiguous matter, so I decided to keep the ones from the CD and add remarks if I know of others in common use. 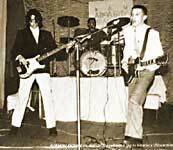 Most of the bands recorded with homemade four-track machines and distributed their music on reel-to-reel tapes. The tracks on this compilation were all taken from such tapes, none of the bands had ever produced a CD or LP before. Igra (Game) was founded by one of the central figures of the "Novaya Scena" movement, Sasha Panchenko, in 1978. In order to get a rehearsal room, they had to play "revolutionary songs" at various official occasions. However, once they had their rehearsal room, they hired guest musicians to play the propaganda songs and used it mainly for their own music. Tovarish (Comrade) was another band by Sasha Panchenko. Like many bands they started out as a political rock band, but they stopped doing it when it became fashionable. Panchenko was fascinated by connections between Kazakhstan traditionals and blues, and Tovarish's music is heavily influenced by both. Elza was comprised of the same musicians as Tovarish, performing the material of bassist and singer Yaroslav Kulikov. They disbanded in 1999, but apparently they reunited in 2004 to play a concert in Prague in 2004. Tshitshka Dritshka (Whatsitsname) was an offspring of Tovarish. They started out as a band which played communist propaganda couplets from the 30s in punk versions, inviting the original authors (who were already in their 70s) as guest singers. When the Novaya Scena movement started, they took their music in an even more dadaist and noisy direction. "King Of Bloody Flies" is a lo-fi punk/no wave attack with lovely drumming on cans, tins, and other metal objects. The bonus track starts off as demented dialogue between a guy repeating the words "Posmeh Mohet" and another guy who is laughing in different ways. After that it turns into a great abrasive tune dominated by repetitive guitar and drumming on metal objects. At the 4 minute mark it gets even better with a theatrical interlude, followed by a total freak-out. 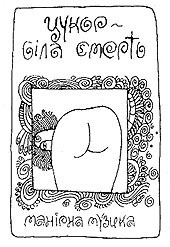 By the way, the words "Posmeh Mohet" come from a misreading of the Cyrillic spelling of "Rasmen Monet" ("Exchange of coins in machine") by some confused English students. Tshujoy (Alien) was also an offspring of Tovarish, and their song "Grass" is one of the weirdest on this compilation, even if you don't understand Russian. The lyrics are about two pussycats committing suicide by jumping from a balcony together, a girl licking bubble-gum off a tree, and other weird stuff. Kazma Kazma was the successor of Tshitshka Dritshka, and whereas they were still punks in spirit, they moved to a much more folkloristic and orchestral sound, with piano, flute, french horn, and trumpet. They are among my favorites on this CD. Gnida was one of the early Novaya Scena bands, playing a kind of minimal noisy no wave, primitive drumming and a few guitar riffs with some of the best screaming vocals ever. Foa Hoka is the successor to Gnida, and the song they play here is an old and sad soldier's song. Since military service in the beginning of the 19th century lasted 25 years, soldiers had all reason to be depressed. 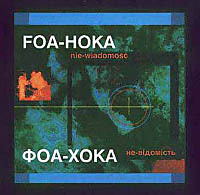 Foa Hoka is one of the few bands that lasted and had some CD releases. Not surprisingly, their sound nowadays is a bit more polished and professional. You can read an announcement for a 2004 concert of them with a short description here. Tsherepahi (The Turtles) was started by two guys who were fed up with being only background musicians in other Novaya Scena bands. Compared to the rest of this compilation, their music is nearly conventional New Wave/Punk, though very raw and dirty, which makes it worth listening to. Rabbota Ho played complicated and warped new wave pop. They lasted until 2003 and released some CDs. You can download their 1991 album Tanets and their last song at Quasi Pop Records. They also have some interesting stuff on their own homepage, but it is all in Russian. This band named itself after the lowest officer degree in the Russian army under Tsar Peter the Great. The liner notes claim that they were influenced by Russian composer Alfred Schnittke, but admit that the track on this compilation is atypical. "Ivan Sheikh" is a beautiful pop song with over-the-top off-key singing, but I would really like to hear their other songs. Apparently they enjoyed cult status in Kiev, but just before their international career was about to take off they broke up in 1990. After starting out singing pseudo-English, Ivanov Down made up their own language. Honestly, more bands should do this. "Outch Putch" is very dark, slow, and dissonant, and "Piepsa" is one great and energetic rock'n'roll lunacy. Aliens would dance to this. Also known as Cukor Bila Smert (Sugar White Death), they are an experimental chamber pop ensemble with piano, cello, keyboards, guitar, and wonderful singing by Svitlana Ohrimenko, who later recorded some solo works under her new name Svitlana Nianio. Their two songs are probably my favorites on this compilation, both are very short beautiful compositions. Later on they would record a surrealistic medieval album as a duo with casio and guitar, and collaborate with electronic band Ivan Someshit. Formed by members of Sahar Belaya Smert and Ivanov Down, Shake Hi Fi (also known as Sheik Hi-Fi) started out playing noise, and turned into a rock band later. The first song presented here, "I like to touch", reminds me of early Sonic Youth, whereas the second one is a great parody of pop cliches. When Ukraine achieved independence in 1991, Novaya Scena gained official status as a cultural group. However, it seems that it became even harder for them to survive because of the lack of money and sponsors. You can read an interesting personal account of Novaya Scena and the aftermath here. There are only very few recordings available of most of the bands on this compilation. The Polish label Koka still has some stuff on CDs and MCs. For the current Ukrainian avant-garde you should definitely check out the NexSound label, run by musician Andrey Kiritchenko. And don't forget Tamizdat for all your Eastern and Central European music needs. Thanks so much for posting this stuff - totally fascinating and fantastic. I've spent a fair amount of time in Russia and Eastern Europe but have never come across this music or any sort of contemporary legacy there. Really great. Another good source for Ukrainian music is UMKA. They're based in Kyiv and you pay basically Ukrainian prices for CDs through them. The times I've bought through them, I've found their service excellent. In response to "Since army service lasted 25 years in the old Soviet Union..."
Thankfully it was just 2 years (3 - in the navy). You probably refer to the XIX century. But anyway thanks for the post. yes, the foa-hoka song is from the times that old. it's great you posted this. that was a really great time for ukrainian underground and i'm pretty sure that a lot of this stuff deserves much more wide exposure. and early nineties Svitlana Okhrimenko's records especially! Absolutely wonderful! After listening to this music I definitely intend to delve deeper into the Ukrainian underground. Thanks ever so much for posting these files! you should totally check out the Lviv (one of Ukraine's provinces/oblas'ts) music scene. Lviv has the richest music scene in the country for sure. Okean Elzy (Elza's Ocean), Plach Yeremii (The Cries of Jeremia), Pikardiys'ka Tercija (Pikardia Third). Some non-Lviv groups like the very famous Vopli Vidoplasova (or simply VV), some hip-hop stuff like TNMK, VYZV, 5'nizza etc. A Happy Happy New Year!